I’m a great believer in the benefits of working your horse from the ground. The methods I use are free schooling, traditional lunging, classical in-hand work and long reining. Working from the ground is great for bringing a horse back from injury, seeing how your horse moves, teaching new skills or just filling in twenty minutes when you don’t have time to ride. I try to do some groundwork once or twice a week, and it’s very beneficial for Blue, who has a weak back. I can use groundwork to build up her back muscles without the added complication of a rider, and I taught her to rein back and turn about the forehand from the ground, so that she could learn to balance without me on top. I’m a relatively recent convert to the more unusual forms of groundwork. I’d always lunged and longreined, but my introduction to the usefulness of free schooling came after seeing a Monty Roberts demo in 2007. I’ve started doing classical ground work even more recently, after seeing a demo with my riding club. I then took a couple of private lessons with the instructor, Emma Robinson, to get me started. It’s a great way to connect with your horse, and keeps you warm in the winter, as you move around the school with your horse. I’d recommend it to anyone, particularly people with horses that struggle to perform certain movements under saddle – but do try and get someone to show you the basics first. The following account of the demo was published in Gallop magazine in 2010. As a novice at the art of in-hand work, I was interested to attend a recent demonstration at Roslyn Stables, North Wales, as part of the regular Horsey Coffee Morning events. The demonstration started with a ‘beginners’ guide to working in hand’, by Emma Robinson. 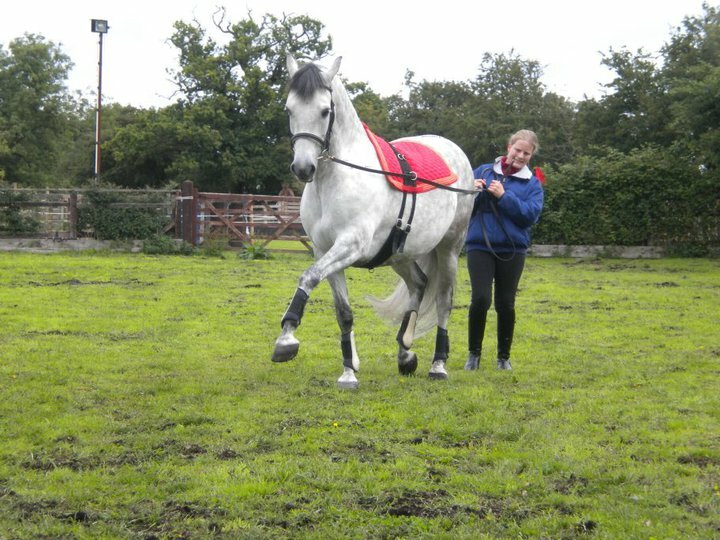 This can be useful to increase suppleness, build up a trust relationship with your horse, and allow you to pick up on subtleties of movement or issues that may be masked when riding. The horse can wear a bridle, lunge cavesson or headcollar, depending on its level of training. Emma began with some preliminary work with 27-year-old Appaloosa Sky, her model for the day. The handler should be positioned by the horse’s shoulder. Emma then spent a few minutes re-inforcing ‘move on’ and ‘halt’ commands with Sky, until he was obedient to her voice. With a well established horse like Sky this was a quick process, but a vital first step. The handler should work in silence unless giving a command so that the horse is not overloaded with meaningless words. Gradually, Sky learnt to respect Emma’s body space, keeping an even distance from her and moving around or away from her as required. Once he was moving freely round the arena and responding to voice commands, Emma started to introduce some simple lateral work. Asking him to bend via slight pressure with the inside hand, she turned a little away from him to allow him to bring his inside legs off the track, before repeating the exercises on the opposite rein. Emma explained that this was enough for a first session, as any new work is tiring at first. The next section of the demonstration covered long-reining, courtesy of Becky Jones and her lovely homebred part Andalusian Simba. Becky uses classical French techniques, and has trained with François Lemaire de Ruffieu, formerly of the celebrated Cadre Noir. This stage involved a bridle, lunging roller and long reins for the horse. The handler should wear sturdy boots, and gloves and a hat are advisory, at least when you first start your horse. Becky recommended using leather long-reins, joined into one continuous length, for more advanced work. However, it is fine to start by using two lunge lines, which give the novice handler the advantage of being able to stand further away from the horse in a safer position, although they are bulkier to hold. Although normally working to a fairly advanced level, Simba kindly agreed to pretend to be a novice for the demonstration, and Becky demonstrated the use of the equipment for a new starter or young horse. Initially, the inside rein is ‘reversed’, i.e. clipped to the roller, then fed through the bit ring to the handler’s hand. The outside rein is attached normally, i.e. clipped to the bit, fed through the roller ring and over the horse’s back to the handler’s hand. ‘The natural tendency of the horse when starting this kind of work is to bend to the outside, and this arrangement of the reins allows him to soften and encourages a more correct bend,’ she explained. The handler starts off by walking parallel with the horse, level with the roller, at a distance of 6 – 8 feet. 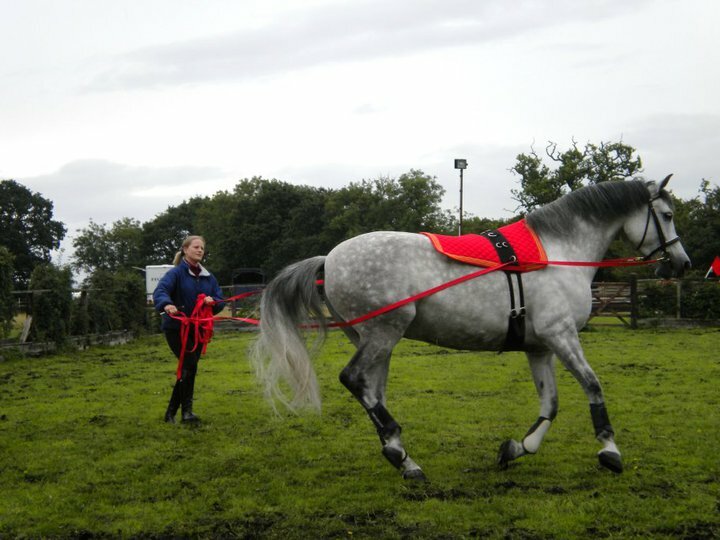 As the horse becomes more advanced and more comfortable with the technique, the outside rein can be dropped behind the haunches and the handler can move behind the horse. 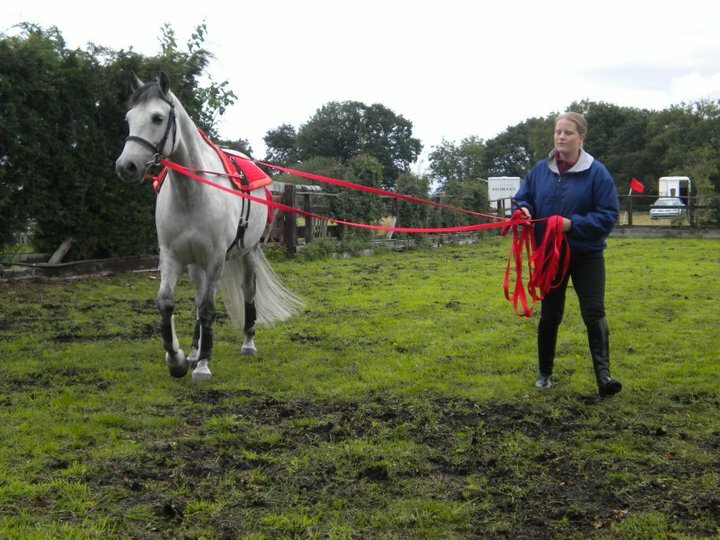 When working, the handler should keep their arms fairly loose and ‘hold’ the horse with their back rather than their hands. Becky asked the audience to imagine walking down a ramp holding onto a laden wheelbarrow to replicate the feeling of ‘passive holding’. The demonstration continued with an impressive display of lateral work – shoulder-in, leg yielding and half pass. Becky explained how she used rhythmic taps of the rein against Simba’s flank to mimic a leg aid and encourage him to move away from her. She pointed out how Simba ‘grew‘ in height as he started to work from behind, as the energy created by these exercises was not being dissipated in forward movement. As a finale, Simba was persuaded to show his more advanced paces, including a newly acquired Spanish walk, but when Becky asked him to demonstrate his ‘terre à terre’ (a very collected two-beat canter, in which the horse moves forward in a series of controlled rears), he suffered from an attack of stage fright and declined to co-operate. Overall, the demonstration offered an interesting overview of the advantages and techniques of working in-hand, and will hopefully lead to a workshop to be held later in the year. Information on this and future events can be found at www.horseycoffeemornings.co.uk.